I have always loved making DIY Halloween costumes, and it’s been especially fun the past two years because my little June loves dressing up for Halloween! It’s all she talks about. This year, she said she wanted to be a princess. I had some ideas in my head and couldn’t decide on just one, so I made three different no-sew princess costumes. 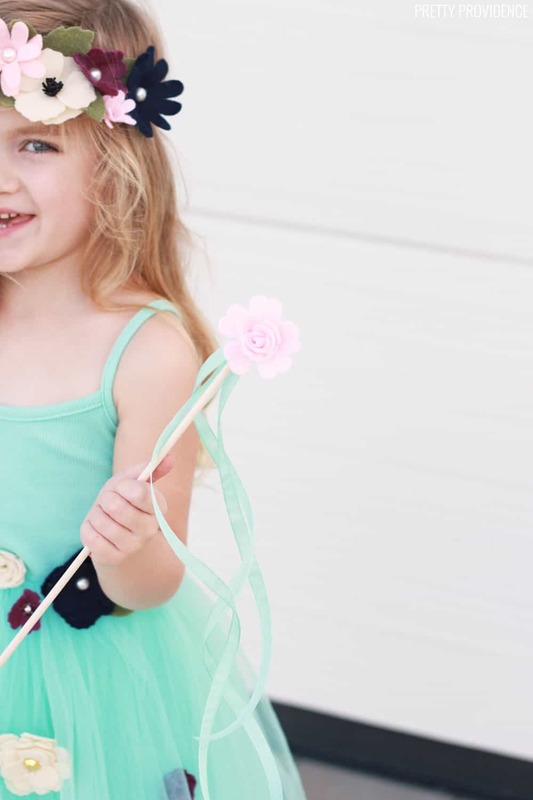 These are perfect for Halloween but also could be great for dress-ups or princess camp, tea parties… really whatever a little girl can dream up. Each of these princess costumes has a theme – butterfly princess, flower princess and star princess! 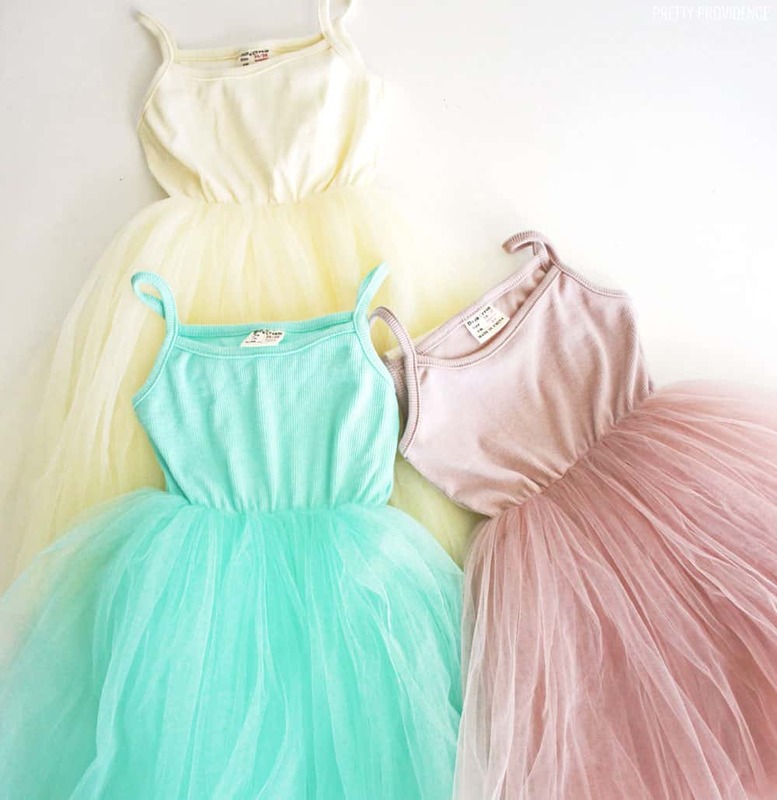 I didn’t want to sew three dresses, so I found these solid colored tulle dresses on Amazon. They are the perfect base to start with! I used my Cricut Maker to cut all of the shapes and details out. The Cricut Maker has a rotary blade, and it is amazing you guys. It cut fabric and felt like a dream with its gliding, rolling action! Some of the fabrics I used were really delicate and it cut them beautifully. Now I will show you how to make all three of these DIY princess costumes. This butterfly princess costume is by far the crowd favorite. I love the fabric butterflies so much! 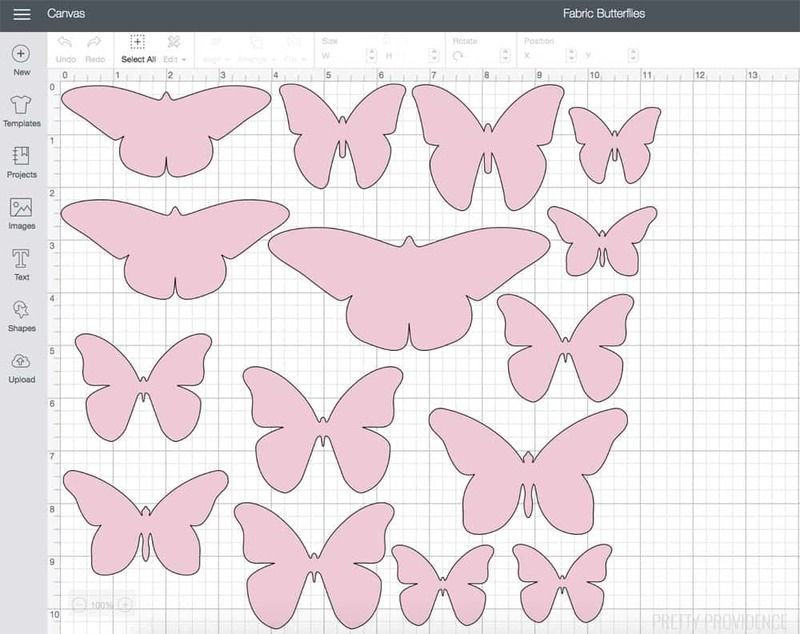 I found a tutorial in Cricut Design Space for making fabric butterfly wall art, and adapted the butterflies to be the right size for the princess costume. They are 3D and just gorgeous, right? Cut a piece of fabric and a piece of fusible interfacing into a 12×12 square. Use an EasyPress 2 or a regular iron to attach the fusible interfacing to the back of your fabric. Fusible interfacing gives the fabric a more stiffness, which is important so the butterflies don’t flop around too much on the dress. Place the square onto your FabricGrip mat with the fusible interfacing side down, and the pattern facing up. Use a brayer to eliminate wrinkles. 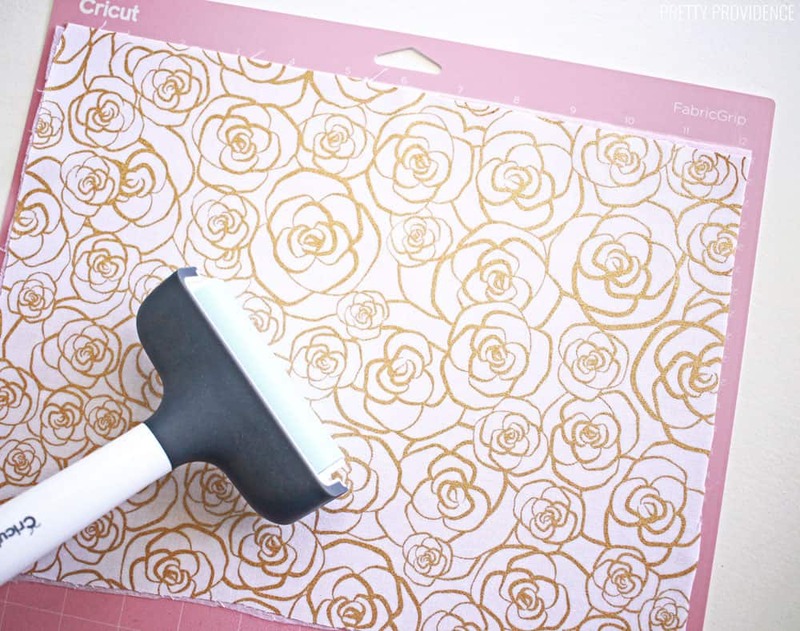 Load the FabricGrip mat into your Cricut Maker and load the rotary blade into the machine. Select fabric as your material, choose ‘edit tools’ and pick rotary blade. Now you are ready to cut! The rotary blade makes perfectly clean, gorgeous cuts. Can you even believe these edges? After carefully removing the butterflies from the mat fold the butterflies in half, pattern facing in. 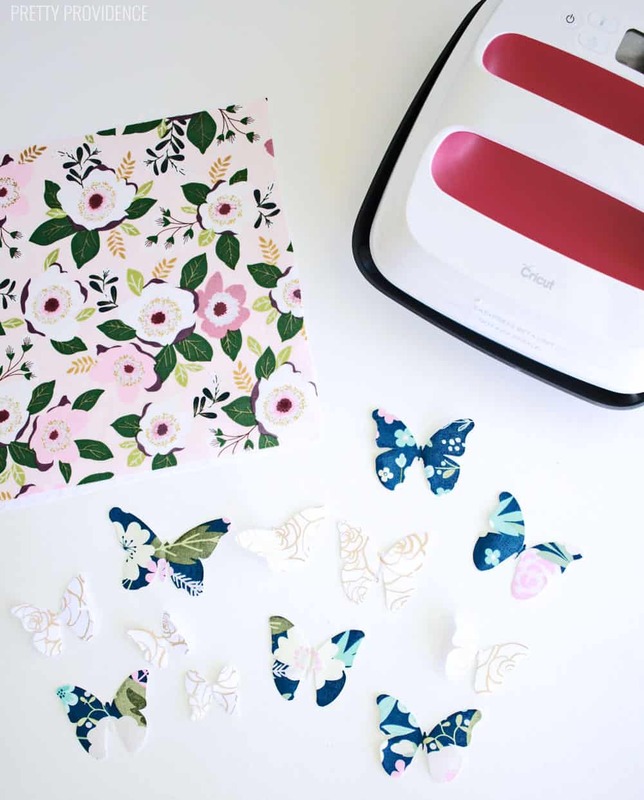 Use an EasyPress or iron and press down onto the butterfly, to give them a permanent fold. Trace the edges of each fabric butterfly with Fray Check so they won’t fray and those beautiful edges will stay clean. 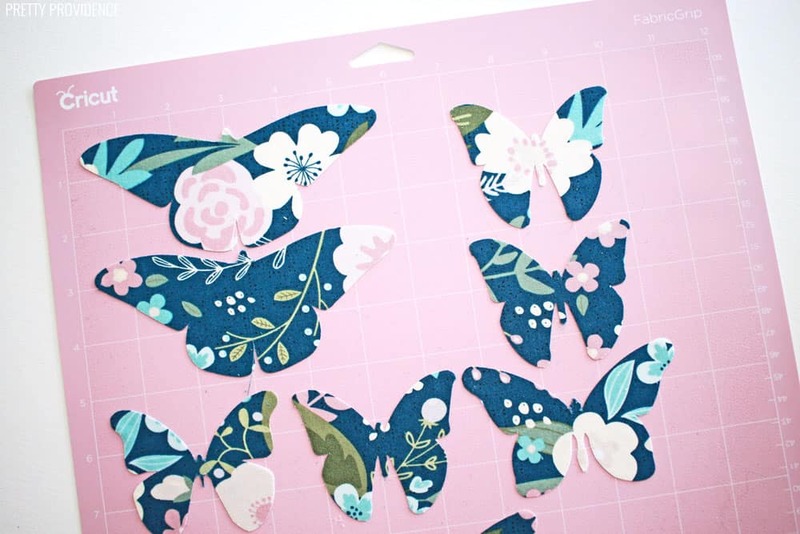 Repeat this process of cutting butterflies with each fabric you are using. I did it 4 times. 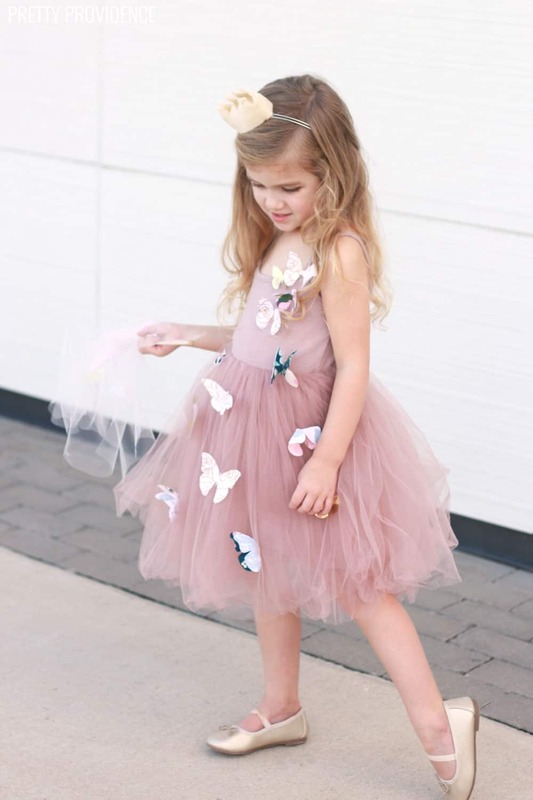 Once all of your butterflies are ready, use a hot glue gun to attach the them to the dress. 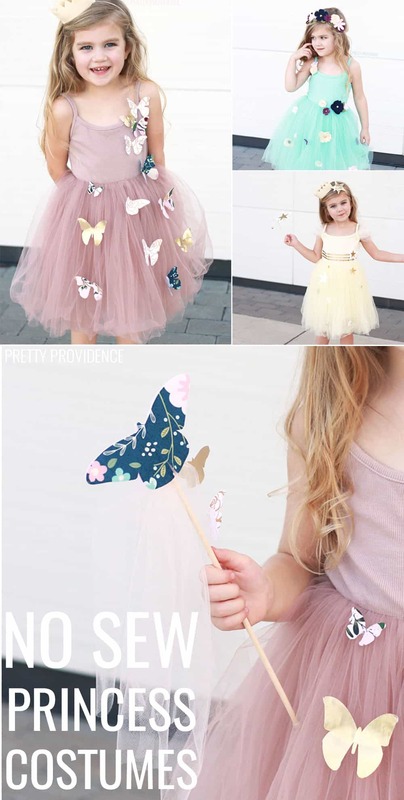 I also had to make a cute butterfly wand to go with this princess dress. The easy tutorial is at the bottom of this post! 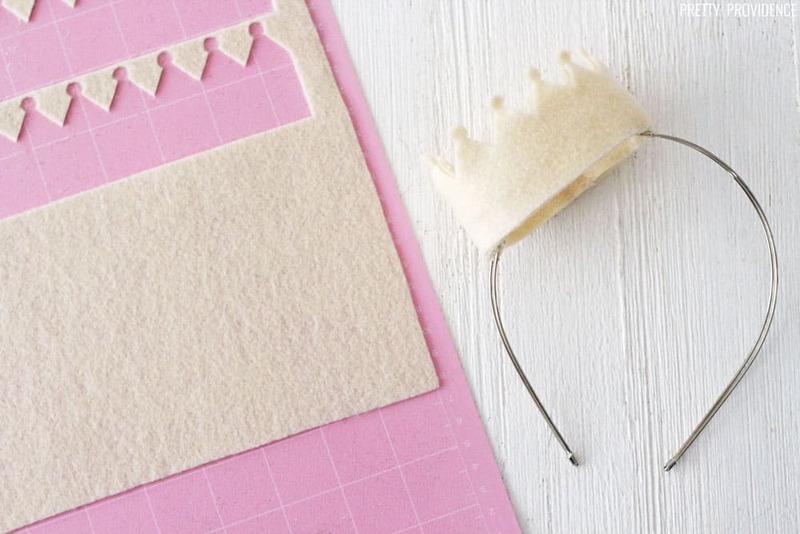 This easy felt crown takes all of 5 minutes to make. 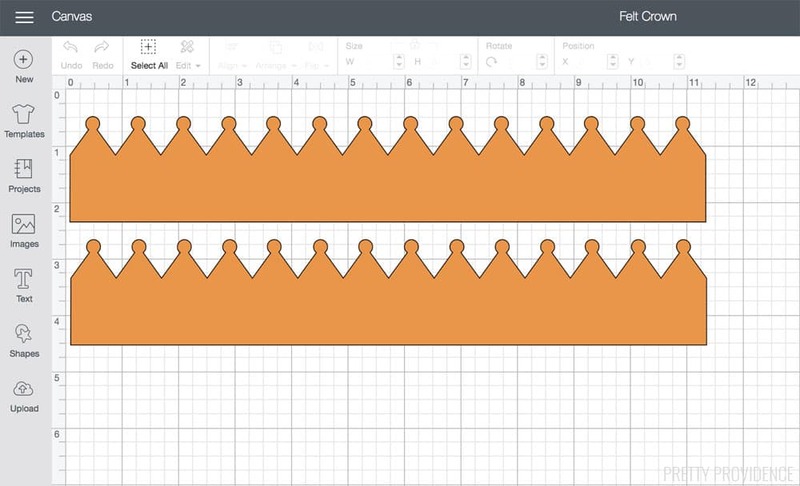 Click here to access the crown template directly in Cricut Design Space. Load the crown template into your Design Space canvas. Put felt on FabricGrip mat and use a brayer to remove wrinkles. Load the mat into your Cricut Maker and load the rotary blade into the machine if it isn’t already. Select felt as your material, choose ‘edit tools’ and pick rotary blade. Now you are ready to cut! This will cut two layers of felt. Use hot glue to stick them together, this gives them more of a sturdiness. No one wants a floppy crown. Fold the crown around in a circle and cut any extra that you want off. I think I cut about 3 inches off mine. Use hot glue to make it round. Use more hot glue to stick either side to the top of the headband. Hold it still until the glue cools. 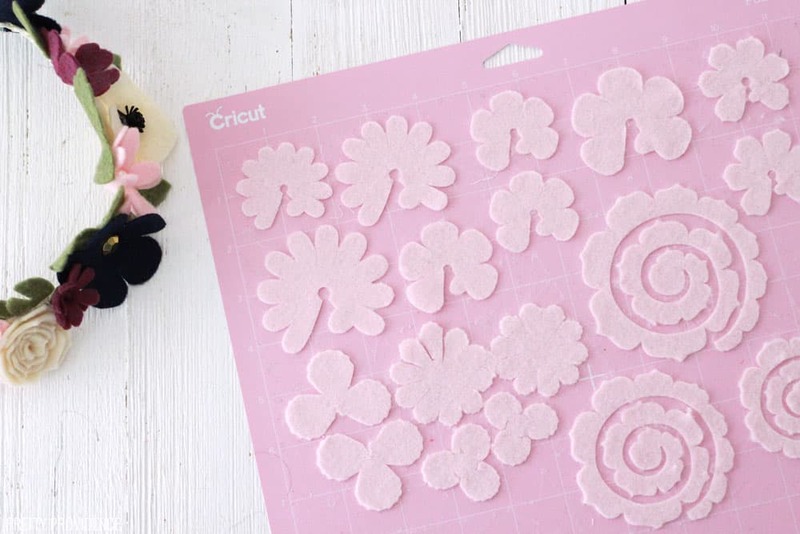 Click here to access the felt flowers template directly in Cricut Design Space. Making felt flowers can be really time consuming. I recommend doing this while you’re watching something riveting on Netflix. I do have a few shortcuts that I’ve learned that helps the process go much more quickly. 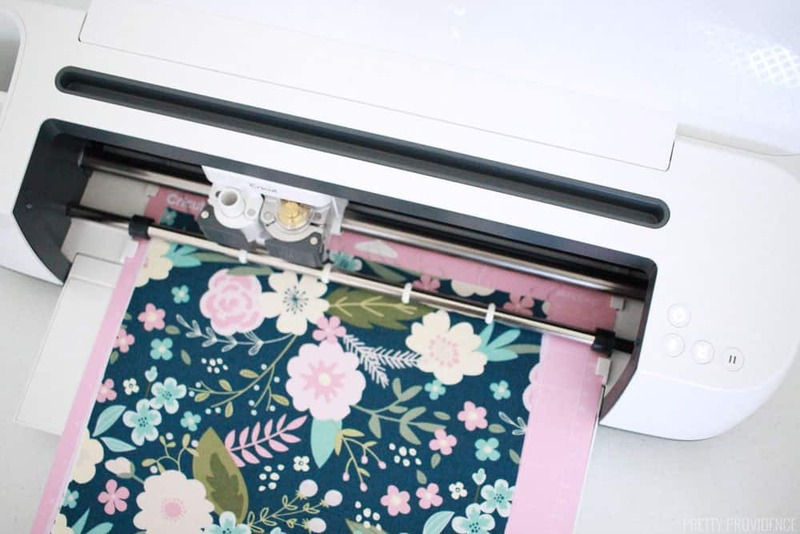 When you load one felt flower into your Cricut Design Space canvas, it will bring all of the different elements of the flower, and then gives your directions to load each different color into its own mat, and then cuts them each out one-by-one. If you’re making a lot of different felt flowers, it’s easier to cut all the pink parts at once, then all the purple parts, and then all the green, etc. You see what I’m saying? To make this easier, I’ve loaded a bunch of the different flower templates into one design canvas. Use this template for each color of felt you want to use. Then, cut all of the leaves and greenery at once, too. Such a time saver! 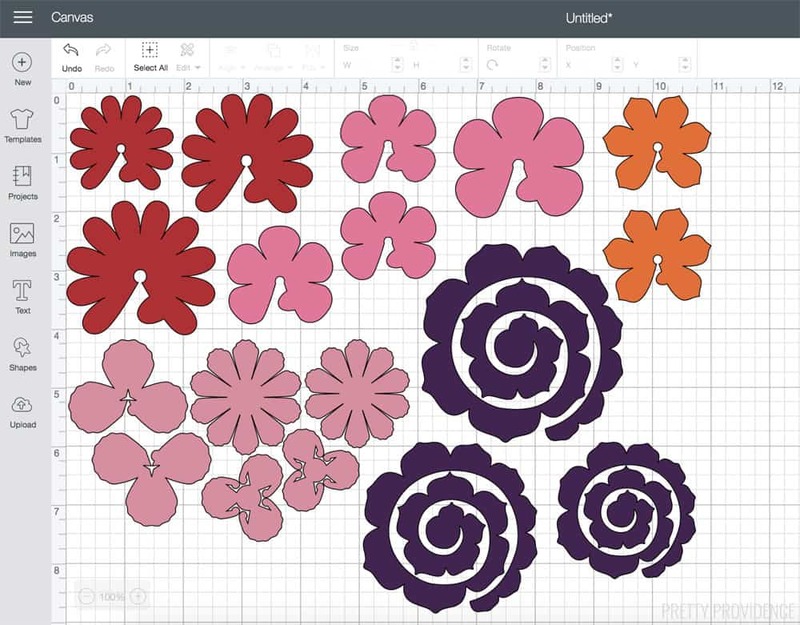 Click here to access the flower template directly in Cricut Design Space. Don’t forget the leaves! 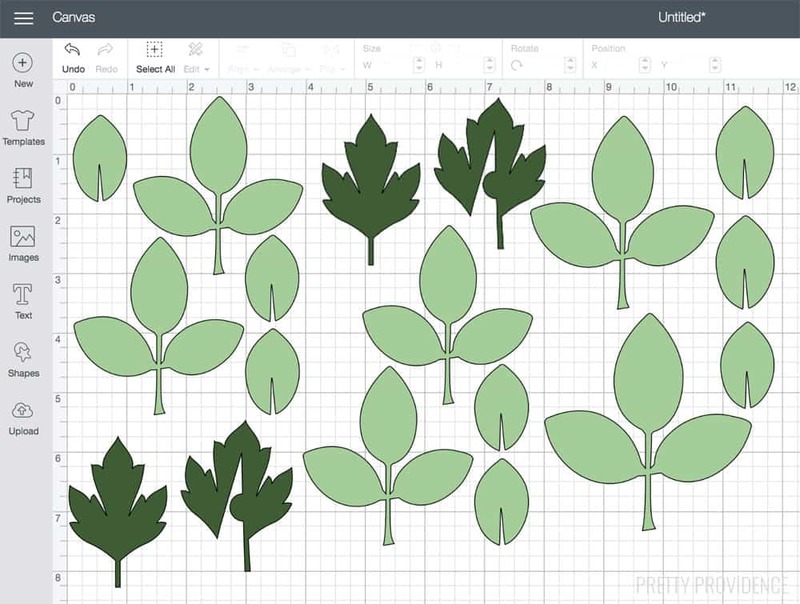 Click here to access the leaves template directly in Cricut Design Space. Assemble your flowers and glue them together with hot glue or fabric glue. Use rhinestones and pearls for the middles, or you can cut pistils out of card stock, like I did for the poppies! First, use hot glue to attach felt flowers all over the dress. Next, make a flower crown. First, use floral wire to measure your head and cut it to size. Twist the ends together. Wrap ribbon around the floral wire. 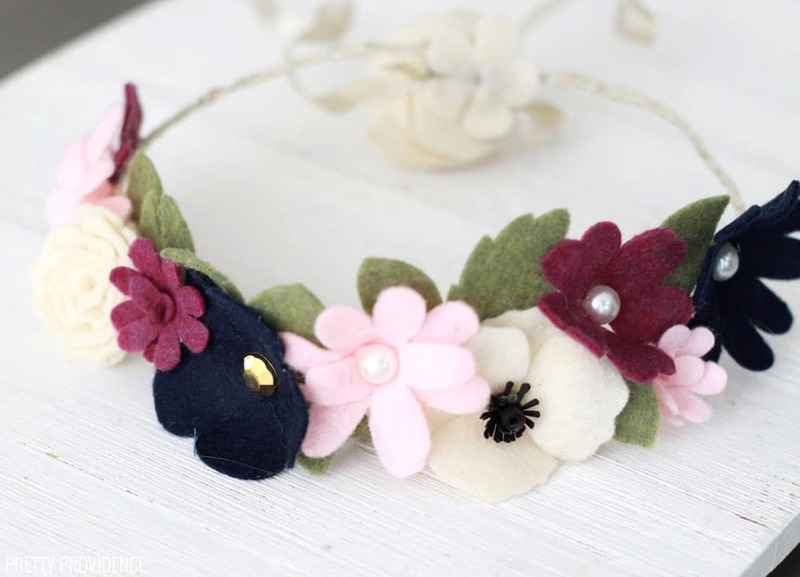 Attach flowers and leaves around the edges of the ribbon-wrapped wire with hot glue. Let glue cool completely before trying to put the flower crown on. 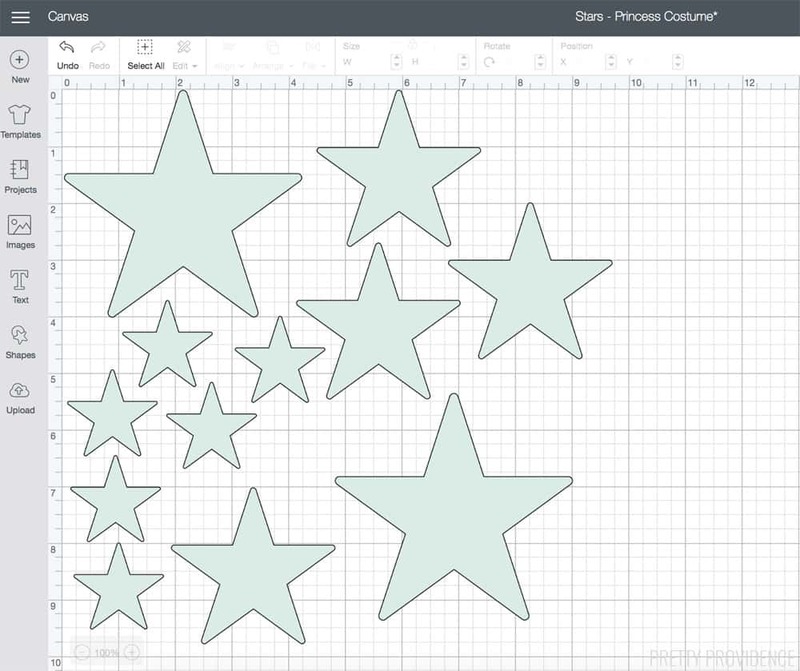 Click here to access the felt stars template directly in Cricut Design Space. First, attach white felt to a FabricGrip mat and use a brayer to eliminate wrinkles. Next, load the mat into your Cricut Maker and load the rotary blade into the machine if it isn’t already. Select felt as your material, choose ‘edit tools’ and pick rotary blade. Now you are ready to cut! Some of the stars needed to be shiny and gold, of course, so I used gold metallic Iron-On on top of felt. Attach gold iron-on to a Standard Grip mat, shiny side down and cut stars using the same template you used for the felt. You will need to switch back to a fine-point blade to cut the iron-on. 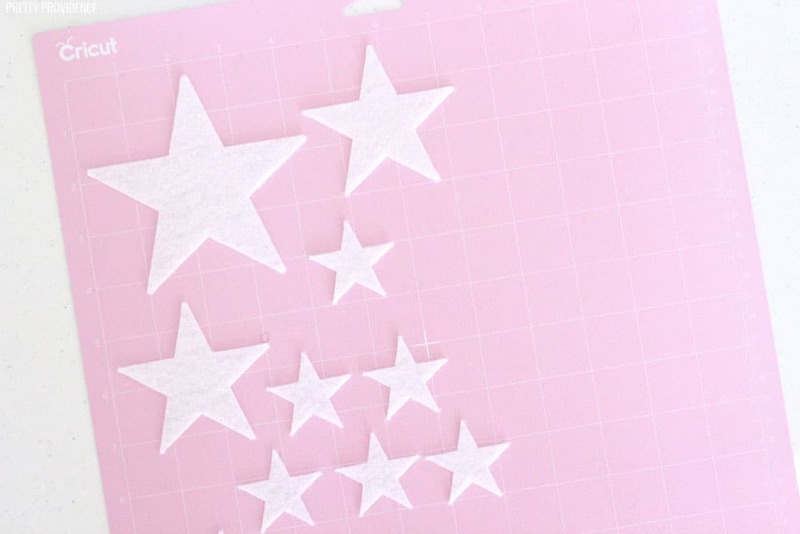 Once your iron-on stars are cut out, use an EasyPress or iron to attach the gold iron-on to the felt stars. 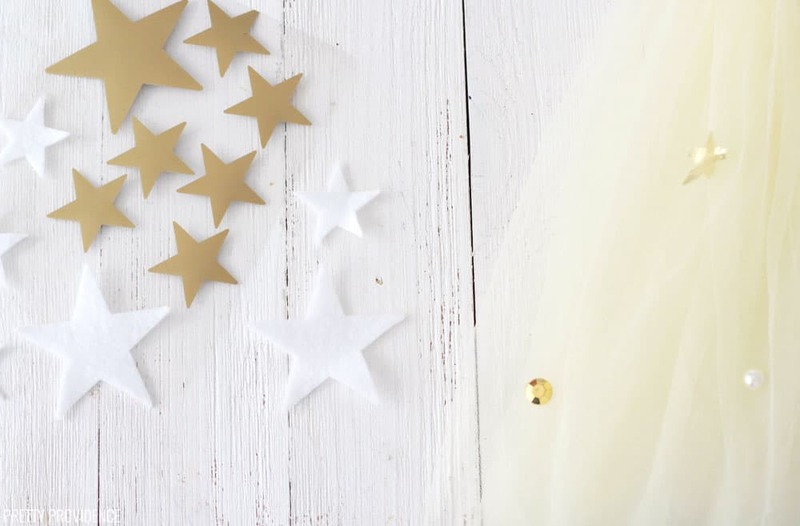 First, use hot glue to stick the white and gold stars to the dress. Next, if you want to add the stripes like I did, I did that using SportFlex Iron-On. It was my first time using SportFlex, but the dress was so stretchy, I knew it was the only way I could add Iron-on details. I love how they turned out, and it was so easy! Then, add rhinestones and pearls to the tulle with hot glue, very carefully. This is a delicate process, and you don’t want the glue to go through more than one or two layers of tulle. I love how they add some extra sparkle and shine to this star princess costume. 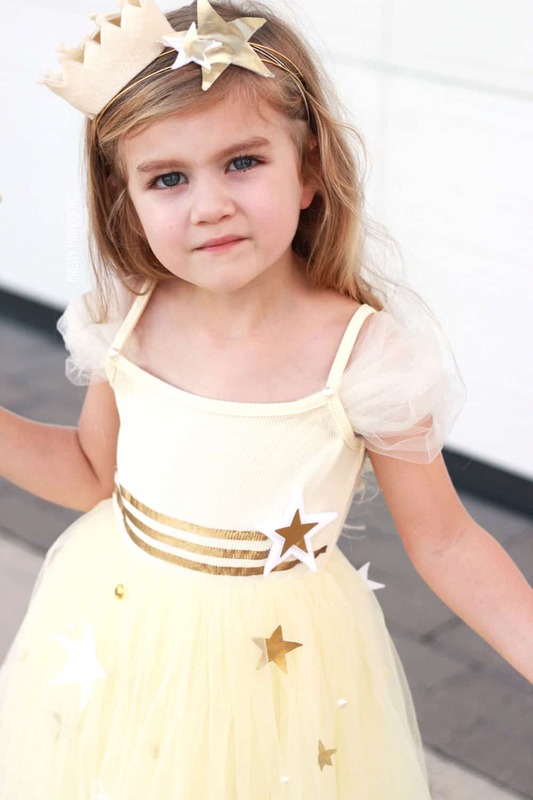 Stick two or three felt and gold stars to the felt crown headband. Fold tulle until it’s at a thickness you like. 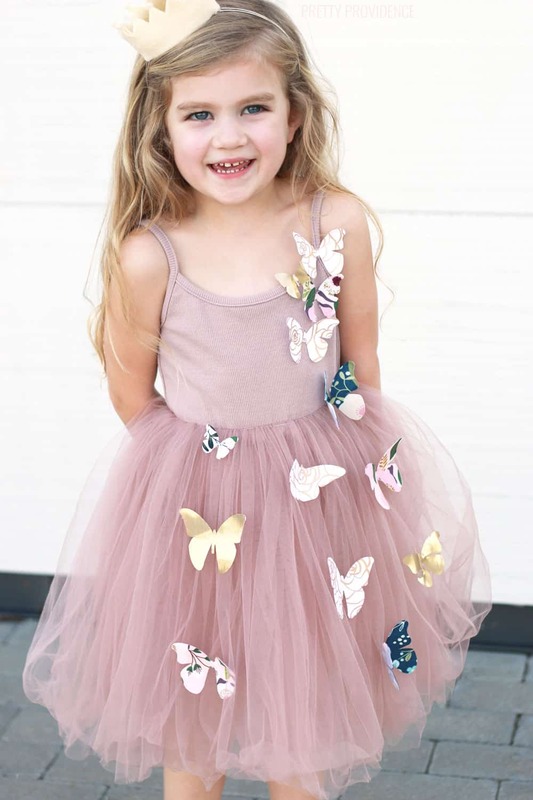 The best way to do this is to have your little one wear the dress so you can measure how long the tulle should be for this. Everyone’s arms will be different! Use hot glue to attach the tulle to the front and back corners of the dress. 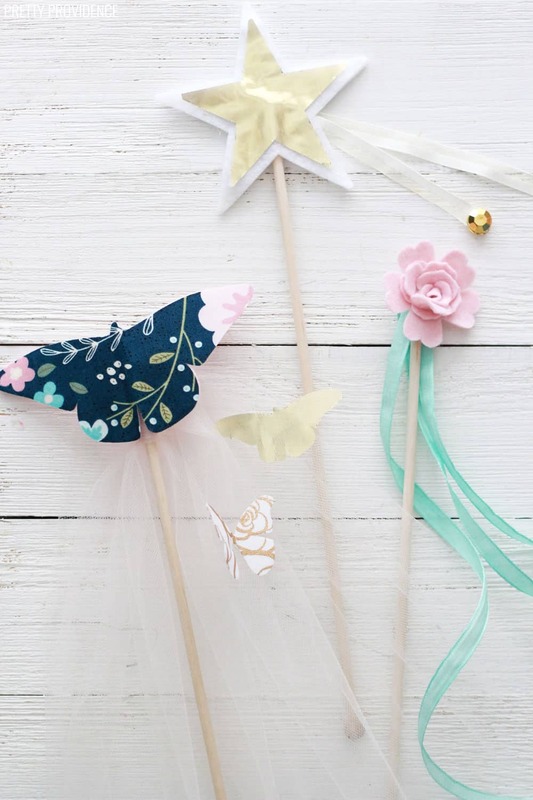 Take a craft stick and use hot glue to attach flowers, stars or butterflies to the top. For the star wand, use two felt stars so it is double-sided. Add ribbon embellished with rhinestones and stars at the ends for a shooting star effect. 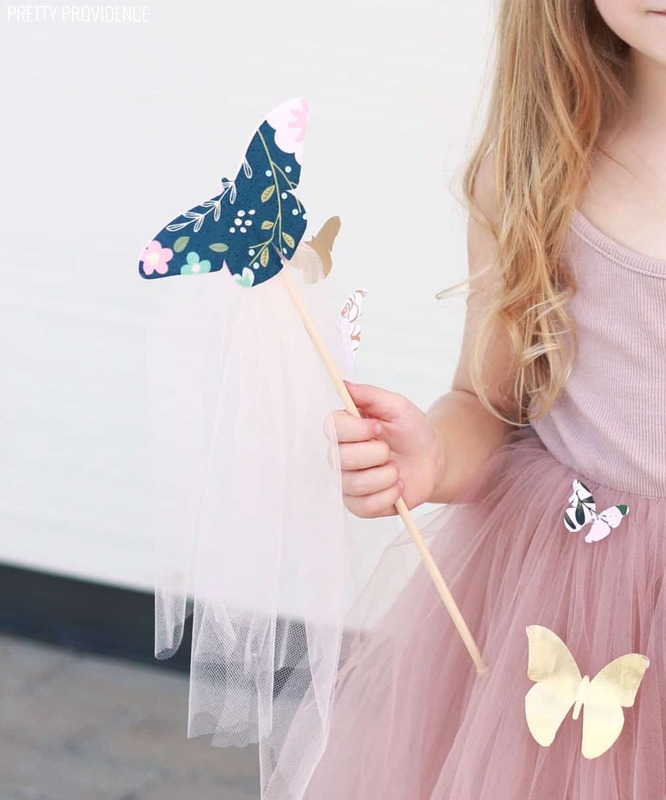 To make the butterfly wand, glue a fabric butterfly for one side, and a felt butterfly in the same size for the back. 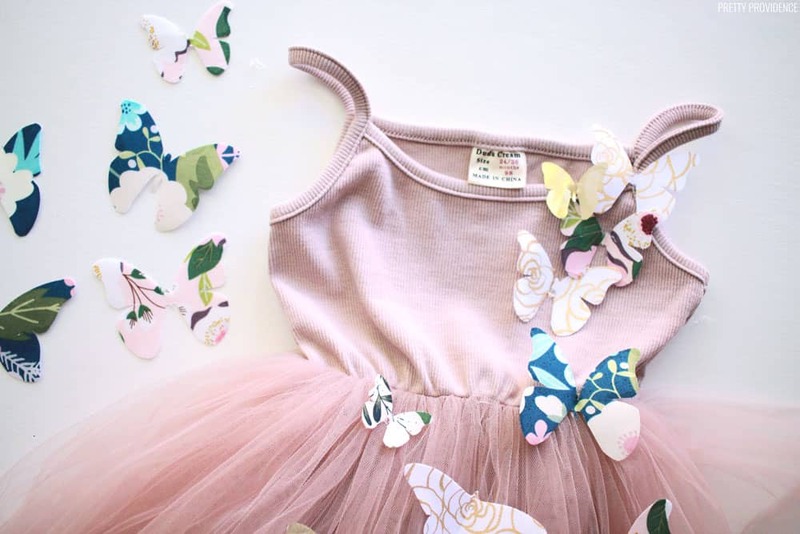 Attach tulle to the bottom of the butterfly and use hot glue to attach small fabric butterflies to the tulle. I am so SO happy with how these easy princess costumes turned out, and so is June! She loves them and wants to wear them all the time. 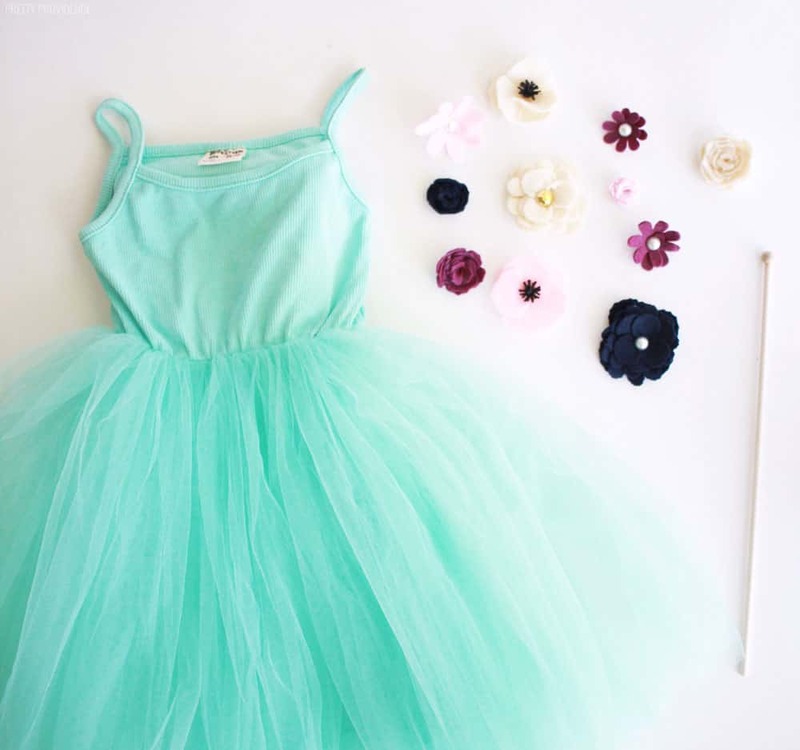 The dresses are perfect for twirling. Do you like to make Halloween costumes? 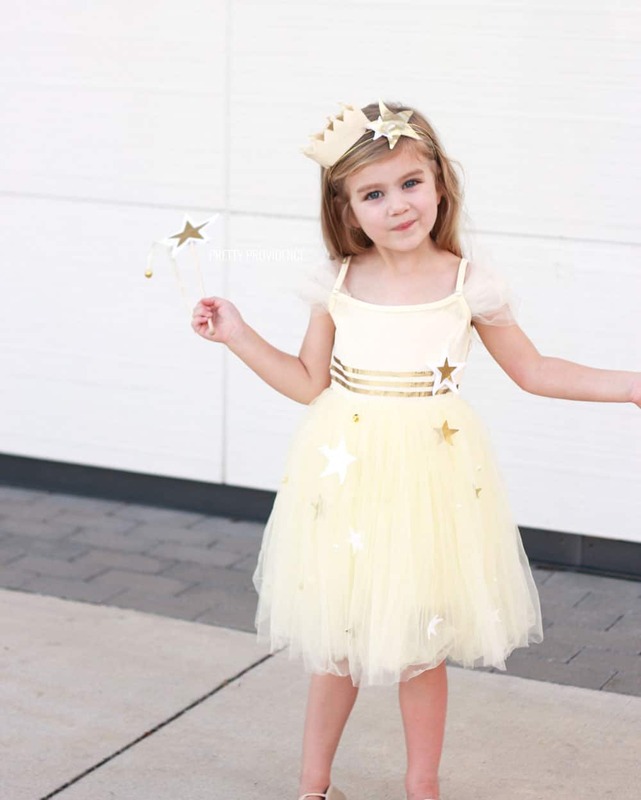 Like these cute DIY Princess Costumes? Pin them! Oh my gosh you are so talented! These tUrned out amazing! Thanks for sharing how to make these! Aw, thank you so much!!! You’re so sweet. 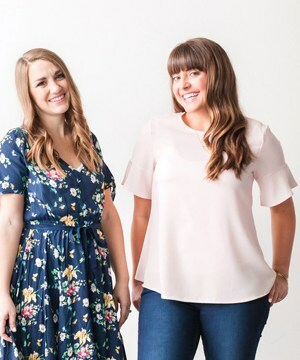 Such an adorable outfits! Beautiful! This is the best! my daughter would go crazy over all of these ideas. These are so adorable! Such great ideas to make them extra cute! Thank you for sharing! These are so precious!! I really need to learn how to use my Cricut machine. 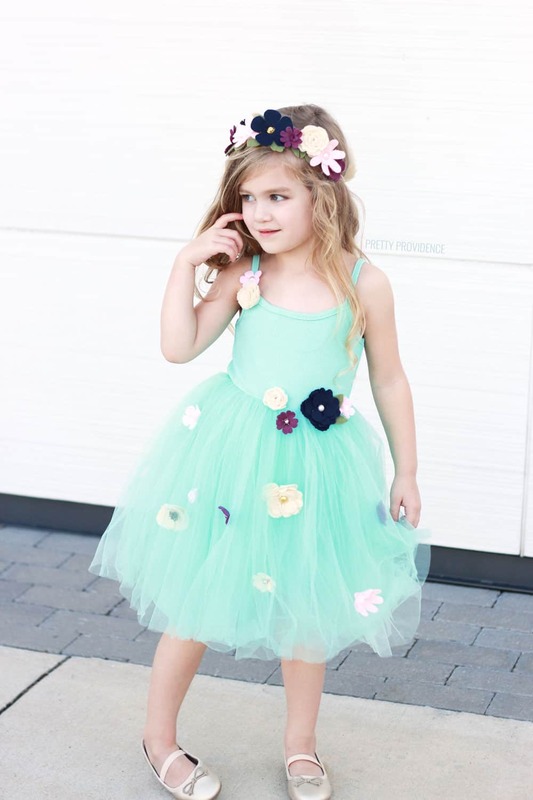 What an easy way to make the cute and simple dress perfect as a Halloween costume!! Thank you so much! Yes, I used to be so intimidated by my cricut but it’s SO easy once you get started!